ALMOST every overseas visitor to Edinburgh who tries haggis declares it delicious — until they’re told what it consists of. A haggis is a sheep’s stomach that’s scalded, pulled inside out, soaked overnight in brine and then stuffed with the chopped heart and lungs of a lamb, a pound of beef, diced onions and a half-pound of oatmeal. The cook then boils the bejaysus out of it and it’s served with bashit neeps and tatties — boiled and mashed turnip and potatoes. On ceremonial occasions, the haggis is piped into the dining room by a guy in a kilt called something like Hamish McSporran and, shortly afterwards, it’s piped out by the emergency plumber. This isn’t the final resting place of a war hero, an industrialist, a renowned scientist or a celebrated poet or author, of whom Edinburgh has produced many. The cuddly toys and squeaky rubber bones that vie for space with the flowers suggest an altogether more humble, but no less revered inhabitant. For beneath the lovingly-tended turf and within stick-throwing distance of the nearby pub that bears his name lie the remains of the most famous dog of all time — and I don’t mean Scooby Doo. Greyfriars Bobby was a Skye terrier who died, aged 16 — or 112 in doggy years, which would make me 336 — on January 14, 1872. 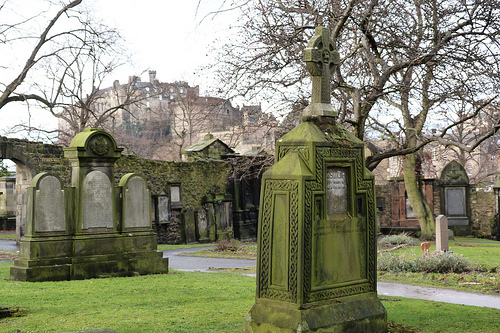 That was almost 140 years ago, but the heart-warming story of this remarkable little scamp lives on and attracts scores of thousands of visitors every year to Greyfriars Kirkyard where he’s buried. Bobby’s master was police officer John Gray, and the unlikely pair were a familiar sight on their daily beat. Police dogs in those days were invariably big snarling brutes you’d cross the street to avoid, but placid Bobby stood hardly halfway up Constable No. 90’s shins. Nevertheless, when ordered into action he was an able ally, as ne’er-do-wells found to the cost of their ankles. Sadly, it was a short-lived partnership of just two years. Gray, who had bought Bobby as a pup, succumbed to tuberculosis at the age of 45 in February 1858 and was laid to rest in Greyfriars Kirkyard. In dying, he gave birth to a legend, because for the next 14 years faithful Bobby remained at his grave, sleeping on it at night when weather permitted and sheltering beneath a nearby tomb when it rained or snowed. In the early days after Gray’s passing, his little dog was frequently chased from the cemetery by caretaker James Brown — the rules said no animals and no children, and Brown was a stickler. He was also, like other watchmen throughout the city, haunted by the memory of the ghoulish deeds 30 years before of William Burke and William Hare who, in the space of just 12 months, murdered 16 people and sold their bodies for dissection to Dr Robert Knox. Not that Bobby was any threat to the residents of Greyfriars — the only bones he was interested in came from the butcher’s bin — but nerves were still raw, Brown was on his guard and everything was done by the book. The gruesome twosome paid dearly for the crimes that horrified Edinburgh (contrary to abiding popular belief they weren’t grave robbers). Burke, from Strabane, County Tyrone, was hanged for murder in front of a baying crowd of 25,000 at the city’s Lawnmarket in January 1829 and his body was publicly dissected in the Medical College. Afterwards, Professor Alexander Monro dipped his pen in the skull and wrote: “This is written with the blood of Wm Burke, who was hanged at Edinburgh. The blood was taken from his head.” The Surgeons’ Hall Museum contains many fascinating yet creepy exhibits including Burke’s skeleton and a wallet made from his skin. The Police Centre Museum on the Royal Mile has a similar wallet. Hare, from Poyntzpass, County Down, saved his neck by turning King’s evidence and fled to London where he was blinded by a mob and spent the rest of his life as a beggar, although it’s unknown when he died. No matter how often Bobby was ejected from the cemetery, he always sneaked back in, squeezing through the bars of the main gates to resume his lonely vigil. Brown soon grew tired of evicting the tiny trespasser and came to grow fond of him. He started feeding Bobby each morning and made him a bed by placing some sacking and an old blanket under the tomb where Bobby sheltered from the elements. Customers in Traill’s Coffee House next to the cemetery gates — it’s now Greyfriars Bobby’s Bar — got to hear of the caretaker’s new friend and encouraged him to come in. But he’d never enter until he heard the one o’clock gun from the castle battlements, which had been the signal for Gray and him to knock off for lunch and is still fired each day. Bobby’s daily ritual began to attract curious crowds who’d gather at the kirkyard gates waiting for the gun to sound. A few seconds later, they were rewarded with seeing the little dog dashing out of the cemetery, running between their legs and heading straight into Traill’s. But in 1867 a bye-law requiring dogs to be licensed was passed and the police were ordered to round up all strays, which were to be destroyed (I won’t tell you how). As masterless Bobby was to all intents and purposes a stray there was, understandably, a public outcry, but common sense prevailed. His admirers raised a petition that was presented to Lord Provost (Mayor) Sir William Chambers who was so moved by Bobby’s story that he ordered that his licence fee be paid indefinitely by the city council. Not only that, but Chambers, who was a director of the Scottish Society for the Prevention of Cruelty to Animals, went out and personally bought him a collar which, along with his dinner bowl, are the most popular exhibits in the Huntly House Museum on the Royal Mile. Just outside Greyfriars Bobby’s Bar, directly across the street from the National Museum of Scotland is the most photographed statue in Scotland, erected to the most faithful little dog that ever cocked a leg. It was commissioned by philanthropist and animal lover Baroness Angela Burdett-Coutts, at one time the richest woman in Britain, who asked the council for permission to install a lasting memorial. The members agreed, and went one better, unanimously awarding Bobby the freedom of the city (others on whom the honour has been bestowed include Sir Walter Scott, Charles Dickens, US Presidents Ulysses E. Grant and Dwight D. Eisenhower, Alexander Graham Bell, Winston Churchill, Queen Elizabeth, Sir Sean Connery and Nelson Mandela). The life-sized bronze statue by WH Brodie, which sits on a granite plinth and was unveiled in November 1873, is a magnet for visitors. Just down the street is the Elephant House Cafe where another legend was born. 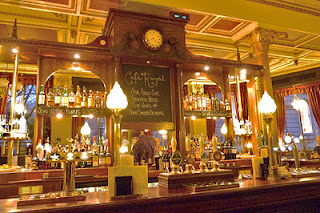 It was here that struggling single mum Joanne Rowling wrote the first words of the Harry Potter series in her notebook. Fans of the boy wizard flock to the cafe every day, and most then stroll the short distance to have their picture taken at Bobby’s statue and, perhaps, have a drink in the pub. If they have their pets with them, there’s a drink for them, too, because at the foot of the plinth is a water trough for dogs. I can’t think of a more fitting tribute to the tiny terrier. I was introduced to The Cafe Royal (www.caferoyal.org.uk) 30 years ago, and I make a beeline for it every time I’m in town. 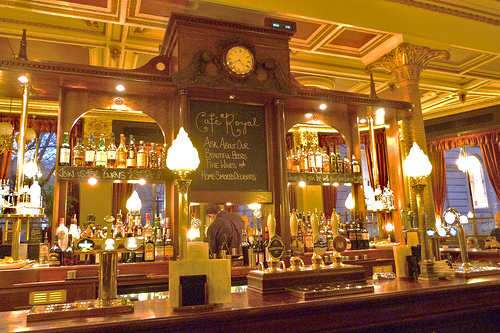 It’s a pub in as much as it serves drink, including many cask ales and a huge selection of malt whiskies, but it’s the decor that stops first-time visitors in their tracks the moment they step inside. I always try to sit facing either of the doors to see their reaction, which is invariably a look of wide-eyed wonder followed by a “Waow!”. The AA Hospitality Awards judges who last month named it Scottish Pub of the Year obviously felt the same. Dating from 1863 in its present location in West Register Street opposite the Balmoral Hotel, it’s a splendid example of Victorian and Baroque elegance where it appears no expense has ever spared in justifying the “Royal”. Stained glass, highly-polished dark woods, marble, ornate plasterwork and brass fittings abound, and the unique Doulton ceramic murals depicting inventors Benjamin Franklin (another Edinburgh freeman), Michael Faraday, James Watt, William Caxton, Robert Peel and George Stephenson at work were made in 1886 yet look as fresh as the day they left the kiln. Fresh, too, is everything that comes from the kitchen. Oysters are the signature dish, but the regularly changed bar menu also offers mussels, fish stew, seafood platters and grilled sea bass plus smoked salmon sandwiches. If you’re feeling particularly peckish, the Stornoway black pudding and apple gratin starter is superb. The 187-room Apex Waterloo Place (www.apexhotels.co.uk) is my home from home in Edinburgh. This 4-star boutique hotel with free wifi, a pool, sauna, Technogym and spa is situated at the eastern end of Princes Street close to Waverley Station and is overlooked by Calton Hill, which affords the best views of the city. ˜For a Burke and Hare evening walking tour of the Old Town (£9.50) see www.westporttours.com. The Edinburgh Dungeon’s actor-led Burke and Hare experience costs £11.20 when booked online (www.the-dungeons.co.uk/edinburgh). IT was just before midday in Galway’s Eyre Square, and outside the Skeffington Arms an elderly English couple were enjoying a cuppa in the sunshine. At the next table a young fella in an Armagh GAA shirt who was still half-cut from the night before put down his pint of cider, nudged his pie-eyed pal and pointed to the husband and wife. “Imagine drinking tea at this time of the morning,” he slurred. I don’t know where the two boyos had spent the previous evening — certainly not in their beds — but if there was an ounce of sense between them they’d have been in The Quays pub in Quay Street. 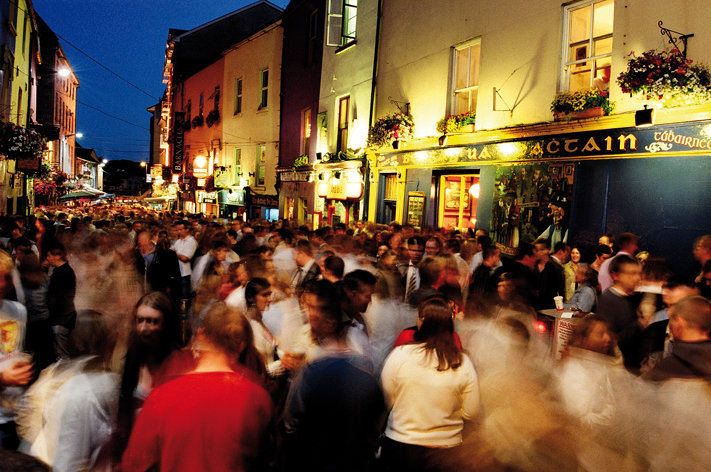 Galway is party town, and The Quays is Party Central, a magnet for locals and visitors who appreciate the best in live bands. If you drop by when covers group Pyramid are playing, which is regularly, you’ll stay until closing time. The Quays, at the heart of the vibrant Latin Quarter, isn’t the only music venue (check out the famed Roisin Dubh in Dominick Street), nor do you need a drink in your hand to be entertained, because the streets of Galway are the stage for Ireland’s best — and best-paid — buskers. If the piles of coins in their open guitar, banjo and didgeridoo cases are anything to go by, those medieval streets are paved with silver. When it comes to traditional music, for which Galway is renowned, there simply aren’t enough hours in the diddly-aye day to sample the countless organised and spontaneous sessions that pack the pubs. The most popular places to spend an evening while the most talented musicians in the west of Ireland do their stuff are Tigh Coili (Mainguard Street/Shop Street), An Pucan (Forster Street), The Western Bar (Prospect Hill), Taaffe’s (Shop Street), The Spanish Arch Bar (Quay Street), The Crane (Sea Road) and Cookes Thatch Bar (Newcastle Road). Foreign visitors often ask how the publicans can afford to pay so many fiddlers, guitarists, flute and accordion players and singers, but the answer is simple — they provide the pints, the musicians provide the tunes. Don’t be surprised if an impromptu gig breaks out in the most unlikely of places. I was queueing for fish and chips outside Harry Fitz, opposite Taaffe’s, when three girls without instruments but with the voices of angels began singing the beautiful and haunting Isle of Inisfree (see www.youtube.com/watch?v=1xn7rjlOxfc to hear Orla Fallon’s version). Even the most boozed-up and boisterous members of that queue fell silent within seconds and passers-by gathered round to listen. The girls weren’t busking, they were simply doing what comes naturally in Galway, and that’s part of what makes the place so very special. I didn’t get to enjoy my meal. Not that I wasn’t hungry — I was starving, as was my pal Aleks. But a pitiable little man standing nearby kept glancing at me every time I raised a chip or a piece of fish to my mouth. And then he came over. He wasn’t looking for money, which came as a surprise. You can’t walk 100 metres in Dublin or go to a cash machine without being hit upon, either by some unfortunate homeless person or those pests in the vests who ambush pedestrians and shove a direct debit form under their noses. But the little man outside Harry Fitz was different. He pointed to my snack box and, in broken English and with a breaking voice, asked if he could have whatever I left. I handed him the box, along with my bottle of water and €20 (he got €10 from Aleks), and he burst into tears and plastered the back of my hand with kisses. I was so overcome I had to walk away, leaving the little man to wolf down the first food he’d eaten in two days. It was a sobering moment in a prosperous city where the social life revolves around drinking. 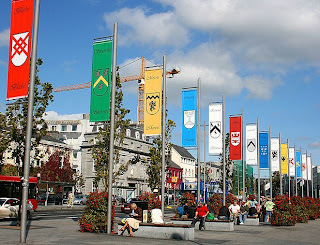 Galway is known as the City of the Tribes, but this has nothing to do with the stag and hen parties who flock there every weekend. Rather, it refers to the 14 Anglo-Norman merchant families — the Athys, Blakes, Bodkins, Brownes, D’Arcys, Deanes, Ffonts, Ffrenches, Joyces, Kirwans, Lynches, Martins, Morrises and Skerrets — who ran the place between the mid-13th and late 16th centuries and still retained some influence into the 19th century. The 14 bamboozling roundabouts that surround the city bear the tribes’ names, but much as those long-gone movers and shakers are held in esteem by the locals, mystified motorists from elsewhere curse them. If Oliver Cromwell’s murderous marauders had encountered such formidable obstacles, they’d have called it a day and gone home. As it was, they invaded this once walled city on the banks of the River Corrib in 1652 and wreaked havoc. In 1691, following the Battle of the Boyne, King Billy and his boys finished the job, and it was nearly 300 years before Galway struggled back to its feet. Today, the city stands proud, and the only invaders are tourists who are welcomed with open arms rather than boiling oil. Described by WB Yeats as the Venice of the west, probably because it’s more often wet than dry (yet glorious when the sun shines), Galway is famed for its festivals, including the Arts Festival (www.galwayartsfestival.com) which takes place every July (next year from the 16th to 29th). 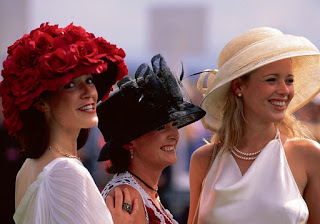 This is the daddy of them all, a two-week test of stamina for performers, exhibitors and the 80,000 Irish and international visitors who fill the streets, galleries, theatres, pubs and cash registers from mid-morning to midnight. The Macnas procession that brings the festival to a close and the packed city to a halt is a wonder to behold as the most marvellously crafted giant puppet figures accompanied by youth and community groups in fancy dress, colourful floats, stilt walkers, dancers, bands and drummers parade from the Spanish Arch to the Fisheries Field. Fifty thousand people lined the streets this year to watch this loud and colourful spectacle. 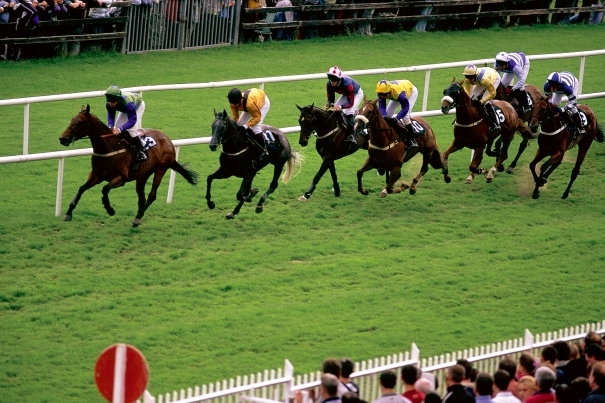 The Arts Festival is immediately followed by the annual Galway Races at Ballybrit (www.galwayraces.com), which next year will be held from July 30 to August 5. 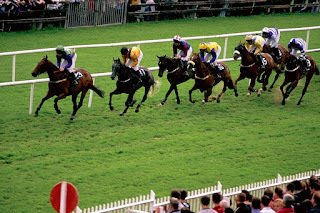 The meeting, immortalised in song, was attended this year by 150,000 racing fans who gambled around €33 million, begging the question, what recession? It also begs the question of why I don’t just host an annual bonfire party and toss tenners into the flames instead of handing them over to sniggering bookie Paddy Power, whose children I’m putting through college. The Continental Christmas Market in Eyre Square (www.galwaychristmasmarket.ie) is a treat. 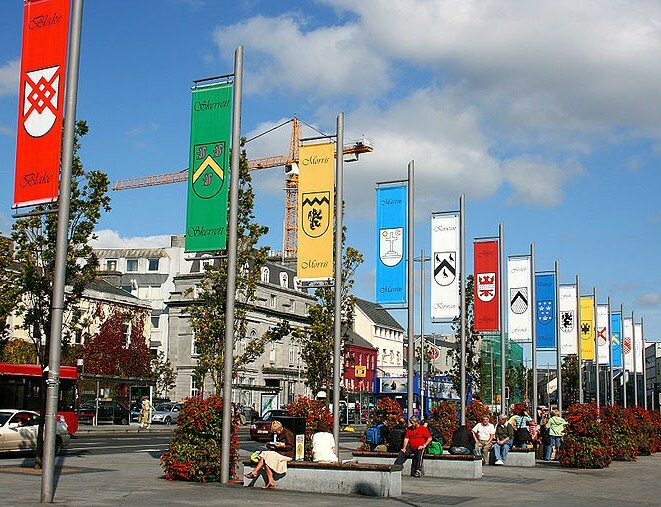 Held for the first time last year, it was such a phenomenal success — 600,000 visitors, with 130,000 saying they came especially to Galway to do their shopping — that it’s back, from November 25 to December 18. More than 70 traders from throughout Ireland and Europe will set out stalls laden with festive goodies as the irresistible aromas of gluhwein, churros and chocolate, pretzels, apple dumplings, paella and Polish sausages hang over the square. I went to the first market and spent most of my time wandering from one fast food outlet to the next, more interested in stomach-fillers than stocking-fillers. Thanks to the German guy who was selling the big fat sizzling frankfurters, I lost my heart to a Galway grill. The annual International Oyster Festival (www.galwayoysterfest.com) at the end of September coincides with the harvest and is the longest-running weekend celebration of all things seafood in Ireland. Established in 1954, it has grown into what the AA Travel Guide described as “one of Europe’s seven best festivals, on a par with Munich’s Oktoberfest” and the Sunday Times called “one of the 12 Greatest Shows on Earth”. In 1960, festival-goers consumed 3,000 oysters. Last year, they swallowed 100,000. I’ve no idea what the organisers do with all those empties, but I do know that when crushed to grit they’re a valuable source of calcium that helps ensure hens lay eggs with strong shells. I guess they’d also make nice earrings. 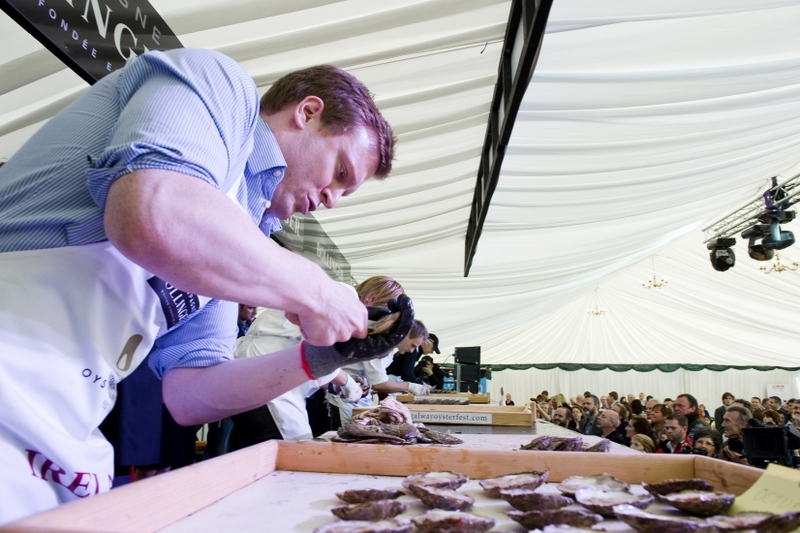 When they’re not slurping live molluscs (don’t fret, they’ve no central nervous system) washed down with Guinness, visitors can watch nimble-fingered competitors vying to become the national and world oyster opening champions, have their picture taken with the Oyster Pearl — a young woman chosen as the face of the festival (if there was a male equivalent he’d be Mister Mussel) — and dine at restaurants participating in the Seafood Dinearound. For those who like to dress up for a glamorous night out, the black tie Gala Ball and banquet on the Saturday is the hottest ticket in town. Mind you, everyone who visits Galway has a ball. The evening before we headed home to Dublin, the little man I gave my snack box to spotted Aleks and I standing outside The Quays and, after some more hand kissing and the blessings of every saint in heaven, offered to sell us his sister for the night, “special price for my friends”. In the space of 24 hours he’d gone from pitiable to pimp. I gave him a mouthful — and this time it wasn’t fish and chips. 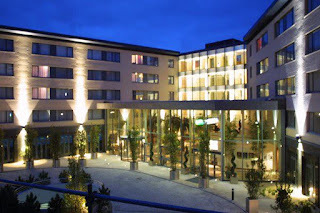 Look no further than the 4-star Radisson Blu Hotel & Spa (call 091 538300 or see www.radissonblu.ie/hotel-galway) if you value comfort, top-class service and all the facilities you’d expect from a respected worldwide chain yet at unexpectedly affordable prices. And, joy of joys, there’s free wifi in the rooms, which is something I always look for when choosing a hotel — if it charges for guests to go online, I go elsewhere. The 282-room Radisson, which also offers adjacent serviced apartments, is tucked out of the way in a quiet location in Lough Atalia Road just three minutes’ walk from the train and bus stations, making it an ideal base from which to explore the city. That’s if you can drag yourself out of bed — they’re the most comfortable I’ve ever slept in. As for the breakfasts, you’d have to travel far and wide to find a more impressive, extensive selection of hot and cold dishes with which to start the day. Go up to the buffet more than twice and the only travelling you’ll be doing is back to your room for an early siesta. One of the big attractions of the spacious and light-filled Marinas Restaurant, where those knockout breakfasts are served and which overlooks Lough Atalia, is the Scandinavian-style buffet option. Offering a wide selection of cold meats, smoked fish, salads, vegetables and freshly-baked breads, it’s a favourite with local people in the know who enjoy a less formal dining experience ahead of, say, a night at the theatre. The extensive a la carte menu is big on seafood, but the succulent rack of lamb and the char-grilled fillet of beef are fabulous too. Vegetarians are well catered for, and there’s a good selection of wheat-free and weight-watching dishes, too. The Atrium Lounge serves bar food from 3 to 10pm daily, and a resident pianist keeps guests entertained on Thursday through Saturday evenings. If you’re there in summer there’s the added bonus of enjoying a drink on the veranda and watching the sun go down on Galway Bay, as the song goes, while the tune tinkles in the background. It never fails to move visiting exiles and Irish-Americans to tears. The very thought of even stepping inside a gym moves me to tears, but hardier — and healthier — guests will find all the exercise equipment they need to keep their hearts pumping in the hotel’s leisure centre. A lot less energetic, and therefore right up my street, is the Spirit One Spa (www.spiritonespa.com) with its wide range of facials and energising head to toe treatments for women and men. Equally enticing if you’re wheezy or have skin discomforts is the Salt Spa, where the watchwords are inhale, exhale, recover. Breathing constantly clean salt air is of proven benefit to those suffering from asthma, bronchitis, hay fever, eczema, psoriasis, sinusitis and allergies. It even helps to alleviate snoring, so lads, don’t be surprised to find an envelope containing a gift voucher under the Christmas tree. Visitors to Galway are spoiled for choice when it comes to fine restaurants, but Aniar (www.aniarrestaurant.ie) in Lower Dominick Street merits a special nod, not only for its exciting terroir-based cuisine but because it has the decency to offer more than 20 wines by the glass from its list of 40 from small artisan producers. The head chef is Enda McEvoy, who probably gets locked in a cupboard every night by husband and wife owners JP McMahon and Drigin Gaffey in case other restaurateurs try to lure him away. McEvoy, who recently spent an inspiring stint in Copenhagen at Nama, the San Pellegrino World’s No.1 Restaurant this year and last, wields not a wooden spoon but a magic wand. With a reputation like that, it’s no wonder it’s wise to make a reservation. McMahon and Gaffey also own the Cava Spanish Restaurant (www.cavarestaurant.ie) next door, and it’s no exaggeration to say it serves the best tapas on the island of Ireland. Other restaurants of note are Da Tang Noodle House in Middle Street, The Malt House in Olde Malt Mall, High Street, Kirwan’s Lane Restaurant and Goya’s, both in Kirwan’s Lane, McDonagh’s in Quay Street and Ard Bia in Long Walk, Spanish Arch. ROCK OF AGES: Aphrodite's Rock, to left of the gap. 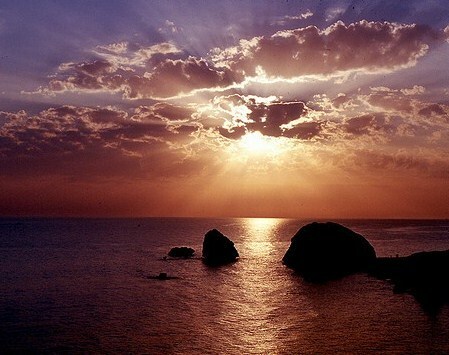 APHRODITE’S Rock off the coast of Paphos in southwest Cyprus is reputed to possess miraculous powers. One legend says that if you swim naked around it three times in an anti-clockwise direction at midnight you’ll enjoy lifelong fertility. Another take on the story promises eternal beauty. But my favourite tantalisingly suggests that for every three circuits you’ll become 10 years younger. Imagine all those elderly men on the beach yelling “Keep going, dear, keep going!” as their exhausted wives sink from sight. There are few more spectacular sights in Cyprus than the sun sinking below the horizon as viewed from this magical spot, though testing the myth could result in eternal rest rather than eternal beauty as the currents around the rock can be treacherous. No such fears in the pool at the 4-star Avanti Hotel in Paphos, where I recently chilled out for four nights and which is clearly doing something right — a couple from England have holidayed there 42 times in the past 18 years. What’s more, they always stay in the same room. I can well understand why they keep returning to this family-owned and family-friendly hotel, though the young lady at reception couldn’t understand when I tried to check out a day early — I got my dates wrong after a night out in the Shamrock Bar across the street. The 243-room Avanti is a favourite with disabled holidaymakers. Ramps indoor and out ensure all public areas are easily accessible to wheelchair users, and three rooms are specially adapted to their needs. I’ve never stayed in a hotel where so much consideration is shown to guests with limited mobility. The Avanti ticks all the boxes as a sunshine wedding venue, too — 32 couples from the UK and Ireland have booked to tie the knot there next year. One pair of newlyweds who were married in the hotel grounds last summer inadvertently left their buttonhole and bouquet behind when they went home, but they’ll find them preserved and lacquered and placed on their pillows when they return next July to celebrate their first anniversary. A nice touch, and another reason why the Avanti gets so many repeat visitors. Sunshine is guaranteed almost year-round in Cyprus, though a late-night torrential downpour accompanied by a spectacular lightning show and deafening thunder provided some relief from the scorching heat. One minute, I was sitting on the terrace of the Shamrock enjoying a beer. The next, I was scurrying inside as the soaked-to-the-skin staff battled to roll down the shutters while rain ricocheted off the street like bullets. The following morning, the mid-October weather was back to normal, with the thermometer showing 70F/21C at nine o’clock. Come 3pm, it was 82/28 — enough to roast the island’s famed waxy potatoes in the ground. Contrary to popular belief, prices in once-expensive Cyprus are now cheap. A pint of the locally-brewed Keo lager costs an average €2.50, and if you smoke, a 20 pack of Marlboro Gold is €4.50. Dinner for two with a shared tuna salad, fried aubergines to start followed by kleftiko (herb-infused slow-cooked lamb) for me, grilled rabbit for my colleague and fresh pomegranates for dessert with two big beers and two Cokes cost €38. When we asked for a couple of eggs in the salad, the waiter stepped into the adjoining garden and lifted them from the hen coop. A little later, he picked the pomegranates from a tree overhanging the dining terrace. That was in Restaurant Pirki, just down the street from the 5-star Grecian Park Hotel in Ayia Napa/Protaras where we stayed for three nights before heading west (the Cypriots drive on the left on great roads) along the coast to Paphos. The 239-room Grecian Park, in Cape Greco National Park, sits on a hill above Konnos Bay where a sandy beach, crystal clear water and an abundance of watersport facilities make it the perfect spot to sunbathe, swim or get towed on a giant inflatable banana behind a speedboat. An open-air cafe and bar with shady trees and a cooling sea breeze overlooking the bay provides shelter when it gets too hot on the beach, though it’s advisable to buy a bottle of water there before attempting the trek back up the steps to the hotel. If you stay in the Grecian Park and decide to spend an evening relaxing in the bar, do the staff a favour and buy rounds. A 14-strong party of respectable, middle-aged but miserly Londoners spent two hours drinking cocktails and then asked for individual bills. The waiter wasn’t impressed — it was a busy night — but he displayed remarkable reserve while he processed 14 separate credit card payments. And not one of them left a tip. Ayia Napa and Protaras in the southeast of Cyprus are for those whose holidays are all about sun, sand and sea. 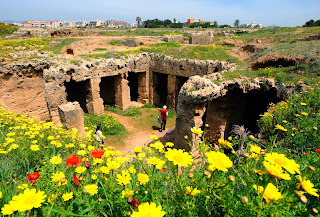 At the other end of the island Paphos, the ancient capital, is more for visitors who like to mix sizzling on the beach with sizing up the sights. With so much to see in and around these popular resorts and farther afield, take an extra memory card for your camera as you’ll be clicking away like a pair of loose-fitting dentures. Paphos’s archaeological park, full of the remains of Roman villas, fortresses and an intact amphitheatre, is a must-see (€3.40 entrance), but allow yourself three or four hours to get the most from your visit. It’s wise to go early to avoid the sometimes slow-moving queues that form to see the fabulous, 1,600-year-old mosaics in the Houses of Dionysos, Theseus and Aion depicting scenes mainly from Greek mythology. The nearby and equally vast Tombs of the Kings (€1.70) is an ancient Greek burial site dating from the third century BC, though the name is misleading as no royal personages were interred there. Rather, the tombs carved from solid rock were the resting places of around 100 moneyed merchants and aristocrats, but they’re so regally impressive that the name has stuck. Both of these World Heritage Sites are on the route of the open-topped tour bus (€12.50), but as neither allows vehicles inside they’re just stops and pick-up points along the way. If you opt to stay on board and simply sun yourself on the upper deck you’ll miss savouring centuries of history, but at least the taped commentary will point out the fire station, police HQ and Debenhams department store. Thrilling stuff. It’s better to stroll to the archaeological park, at the castle end of the esplanade, and if you want to see the Tombs, the 615 local bus (€2 return) will leave you at the entrance, but be very careful when crossing the busy main road to the bus stop for the trip back into town. If one spot in Cyprus is in urgent need of a light-controlled pedestrian crossing, it’s this one. 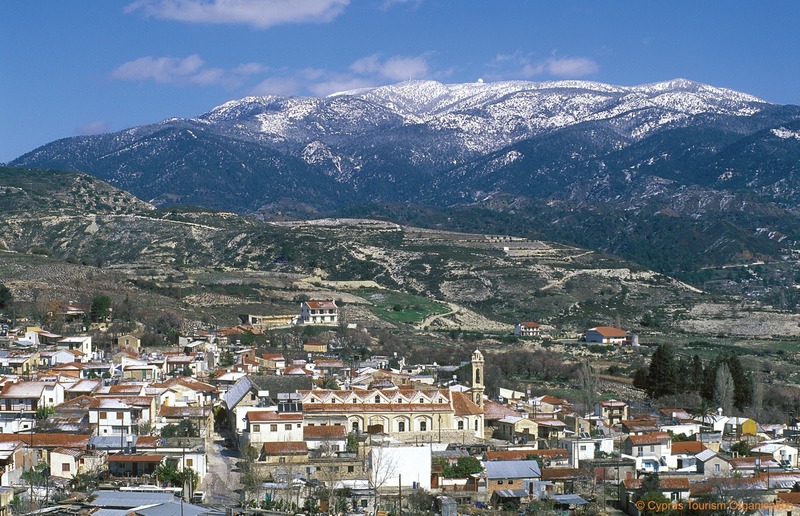 Paphos is an ideal base for excursions, and especially good are those offered by Andreas Coaches (call 00357 99602200), with hotel and villa pick-up and drop-off. Among the tours to choose from are Famagusta in the Turkish-occupied north of the island (€30, every Saturday, bring your passport); the capital, Nicosia, from where the Cyprus jury unfailingly awards Greece the maximum 12 points during the annual Eurovision Song Contest (€20, Friday); and Limassol (€20, Friday). We joined the Troodos Mountains trip (€20, Monday and Thursday) that takes in the wine-producing village of Omodos with free tastings, Mount Olympus for sweeping views of Turkish-occupied Northern Cyprus (the Turks invaded in 1974) from the island’s highest vantage point, Kykkos Monastery and the tomb and giant statue of former president Archbishop Makarios. The journey was a bit scary at times as driver George negotiated hairpin bends overlooking 1,000-foot drops like those in India in Ice Road Truckers: Deadliest Roads, but we were in safe hands. Kalliopi Travel & Tours (00357 26818534, www.kalliopitravel.com) also offers a wide selection of day excursions, including a Jeep safari, and organises boat trips and scuba diving, so there’s no excuse for not getting out and about and exploring all that this divided but delightful island has to offer. Airports are great places for people-watching and eavesdropping, and Larnaca was no exception as we killed time waiting for our flight home. While mooching around in duty free, I spotted a remarkably sunburned man from Northern Ireland filling his arms with cartons of cheap cigarettes, much to the dismay of his teenaged daughter. FROM DUBLIN: Thomas Cook Holidays Ireland operates weekly flights from May 27 to October 14, with 7 and 14-night package holidays and flight-only deals available. Choose from more than a dozen properties offering self-catering, B&B, half-board and all-inclusive in Ayia Napa, Protaras, Penera and Paphos. Packages start from €569 per person sharing based on 7 nights at the 3-star-plus Rising Star Apartments in Protaras. See www.thomascook.ie or call 01 514 0328. 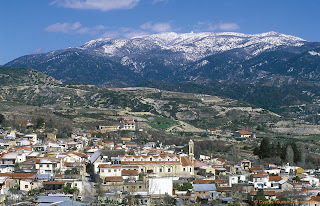 FLY: See www.flythomascook.com for dates and prices of seasonal flight-only deals from Dublin and Belfast. STAY: For independent travellers booking their own accommodation, the Grecian Park Hotel, Ayia Napa/Protaras (www.grecianpark.com) and the Avanti Hotel, Paphos (www.avantihotel.com). EAT: In Protaras, Restaurant Pirki (see above) for kleftiko, rabbit and moussaka. In Paphos, Restaurant Ta Mttavia and 7 St. George’s Tavern for traditional meze (umpteen small dishes of different meats or fish served hot and cold, savoury and spicy, with salads, breads, cheeses and yoghurt, for a minimum of two persons), The Seagull and Theo’s for seafood, The Pelican for grilled sardines, Hondros for kleftiko, Chloe’s for Chinese, Gold Sakura for Japanese. The Pinguino Cafe-Restaurant deserves special mention for going out of its way to provide a selection of gluten-free dishes (it also serves the best cocktails and ice cream in town).